The House minority whip is urging Democrats to vote against the bipartisan budget deal. 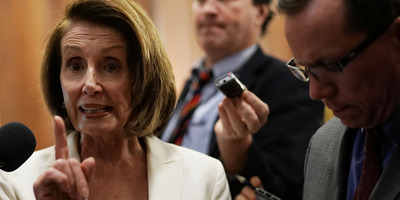 Minority Leader Nancy Pelosi, who on Wednesday delivered an eight-hour floor speech opposing the plan because it does not address the Deferred Action for Childhood Arrivals immigration program, said she was not whipping her colleagues to vote against it. The budget deal has also lost considerable support from conservatives, such as the House Freedom Caucus. WASHINGTON – House Democrats, led by Minority Whip Steny Hoyer, have reversed course and started whipping members to vote against the bipartisan budget deal to fund the government and avert another shutdown. The Senate, whose leadership have agreed on the deal, is expected to vote on the bill late Thursday. In response to a member’s question about how to vote on the plan, Hoyer wrote, “Unlike in the Senate, there is no agreement that the House will even consider legislation to protect Dreamers,” using a nickname for the young unauthorised immigrants granted protection from deportation under the Deferred Action for Childhood Arrivals program, which is set to expire early next month. “By leaving this vital issue unresolved, this package leaves Dreamers isolated, without a path to resolution in the House,” Hoyer said. House Minority Leader Nancy Pelosi said she would not pursue a coordinated effort to vote against the plan, though a senior Democratic aide told Business Insider that Pelosi agreed with Hoyer. “I’m just telling people why I’m voting the way I’m voting,” Pelosi told reporters. Pelosi on Wednesday delivered an eight-hour speech on the House floor, calling out House Speaker Paul Ryan for not bringing forth a bill to address DACA. But the budget deal will need significant Democratic support to pass the House. The ultra-conservative House Freedom Caucus has formally said it will vote against the plan, though a couple of members are expected to break off and vote for the deal.